King Tut used to rule Egypt. Now he's stuck in Middle School. 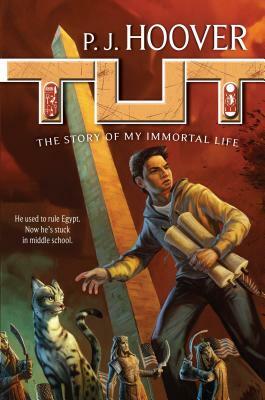 Granted the gift of immortality by the gods—or is it a curse?—Tut has been stuck in middle school for ages. Even worse, evil General Horemheb, the man who killed Tut's father and whom Tut imprisoned in a tomb for three thousand years, is out and after him. The general is in league with the Cult of Set, a bunch of guys who worship one of the scariest gods of the Egyptian pantheon—Set, the god of Chaos. The General and the Cult of Set have plans for Tut… and if Tut doesn't find a way to keep out of their clutches, he'll never make it to the afterworld alive. P. J. (Tricia) Hoover wanted to be a Jedi, but when that didn’t work out, she became an electrical engineer instead. After a fifteen year bout designing computer chips for a living, P. J. decided to start creating worlds of her own. She’s the author of Tut: The Story of My Immortal Life, featuring a fourteen-year-old King Tut who’s stuck in middle school, andSolstice, a super-hot twist on the Hades/Persephone myth. When not writing, P. J. spends time with her husband and two kids and enjoys practicing kung fu, solving Rubik’s cubes, watching Star Trek, and playing too many video games.